Aloe Vera activates new hair growth along with the growth of already existing hair follicles by increasing the blood circulation to the scalp. 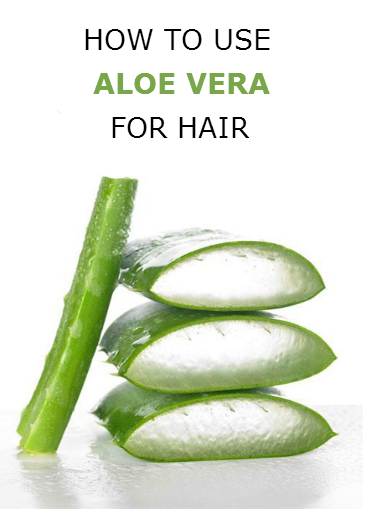 Aloe Vera contains a kind of enzyme that helps in new hair growth for some people. It also cleanses the scalp by balancing the pH level of the scalp. When the scalp is clean and blood circulation to the scalp is good, nothing can stop from proper and faster hair growth. Mix equal parts of aloe vera gel and your shampoo and use it to smooth dry hair and relieve dandruff or dry, itchy scalp. Apply aloe vera gel to your hair or just add it to your conditioner and use it on your hair. leave it on for few mins and rinse off for softer, smoother hair. You can add a drop of essential oil to the aloe vera gel to add a subtle fragrance to your hair. Once a week treat your hair to an at home spa hair treatment using a hair mask, just mix aloe vera gel and olive oil, leave it on for 30 mins to stimulate and promote hair growth. Fill a spray bottle with 1 tbsp of aloe vera gel, 1/2 cup of water and add few drops of essential oil. Shake well before use and mist it on your freshly washed hair to add moisture and shine to your hair. Mix all the ingredients together, pour it in a spray bottle and mist it while your hair is slightly damp. You can use it before and after shower to strengthen your hair and add shine to it. Store your homemade hair spray in the refrigerator to keep it fresh. Add a few drops of your preferred essential oil – peppermint oil improves blood circulation, lavender soothes and promotes hair growth and tea tree acts as an antiseptic to fight dandruff.